Ah, my years-long love affair with the flip chart. Even with the countless tech tools that are at our fingertips, sometimes you just can’t beat the simple value of a good flip chart during a training session or workshop. Despite technical difficulties and dead batteries, the dependable flip chart is always there, a go-to visual aid, presentation asset and teaching tool. Effectively using a flip chart while facilitating is an acquired skill. An art form, even. The good news? With a little practice, it’s a skill that can be mastered. Even if you’re not an artist. Even if you don’t have fantastic penmanship. It’s possible! 1. Use dark colors, like black or blue, for your text. Avoid hard-to-read colors like yellow for writing. 2. Use separate pages for separate ideas. Don’t try to cram too much onto one sheet! 3. Post your flip chart pages on the walls for reference throughout your session. Self-stick flip charts are perfect or this. If you don’t have self-stick, keep a roll of masking tape and/or painter’s tape handy! 4. Even if you’re not an artist, add graphics, pictures or flowcharts on your flip charts when it makes sense. A visual representation can often be retained better than a page full of words. 5. A great trick for remembering nuggets, notes or stats to write on your flip chart is to write a reminder on the page VERY LIGHTLY in pencil…you’ll be able to see it up close, but your audience won’t. You can also do this with graphics or drawings – sketch lightly in pencil, then trace over it in marker when you’re ready! 6. Print clearly. Take your time, if your penmanship isn’t the greatest! Don’t attempt cursive – it’s too hard to read, especially from the back of the room. 7. Stand to the side of the flip chart/easel as you write, so you don’t block it. 8. Along the same line, avoid talking “at” your flip chart while you’re writing on it. Face your audience so they can hear you AND see what you’re writing! 9. Always use markers that have a relatively broad tip, so they can be seen clearly from the furthest points in the room. I’m a total marker snob – Mr. Sketch is the only flip chart marker I will use. Trust me on this one…Mr. Sketch is the best. Accept no substitutes. 10. Avoid using red or green markers – studies show that 7-10% of the population have red-green colorblindness. This condition makes it very difficult to distinguish these colors. I never gave this much thought until I learned that a good friend of mine has this condition; since learning this, I try to be aware of this possibility with my participants. Just like learning how to use PowerPoint or other technical tools effectively, a little effort and practice goes a long way with more “traditional” presentation skills. The humble flip chart still has a place in today’s training session; using this method with confidence will enhance your “stage presence” and better connect you to your participants! Free Resource! Click the button to download these 10 tips…be kind and share with a colleague! 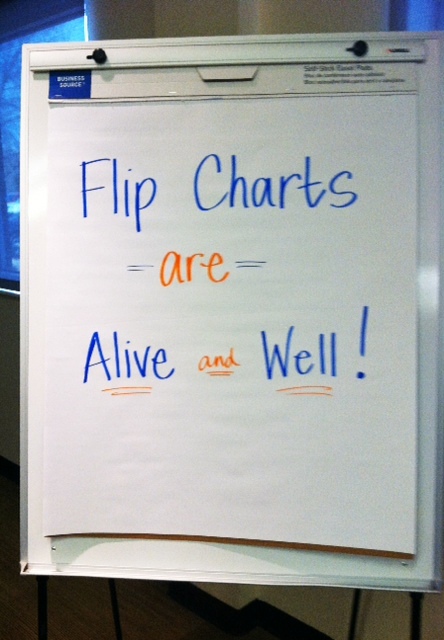 Your turn: What flip chart tricks of the trade have you learned throughout your career? Share a tip with others in the comments below! Receive phase(two)learning goodness directly in your inbox! New content is published every Wednesday. Take a moment and add your email address in the upper-right corner of this page to subscribe. You’ll be glad you did! Michelle – totally agree! One of the things I was tempted to put into the Accidental Trainer blog post of “Things I would tell myself…” was to practice more at flip charting! It takes practice to perfect the art of writing on a flipchart – speaking and writing while facing an audience so that your writing isn’t mistaken for that of a serial killer. It’s hard and seriously we all need to work harder at this skill. It is totally distracting in a session if your writing cannot be read by the audience. It’s like putting up a PPT screen and then apologizing “I know you can’t read this chart but…” We all know what we say to that…”then don’t show slide!” Same rule here. Practice your writing and stop making your classroom go in mass to their eye doctors! Amen, Shannon! I don’t use them as often as I used to, but I was flip-charting during a workshop today (before I saw this comment – how timely! ), and just thinking about how my writing isn’t as nice as it used to be…not sure if we’re at “serial killer” status yet, but I had to be very mindful of how my writing looked. It’s a learned skill, but I’m finding it’s also one that must be maintained! Have a great weekend! That’s a great list Michelle. I especially like #5, about writing notes to yourself, or lightly drawing in pencil beforehand so you can look like a pro!